Fact: Add avocado to anything and it makes it 10x more delicious. Same deal with salsa, specifically fruit salsa. The rich, creamy texture of the avocado pairs perfectly with the sweet mango, and bite-y red onion. And, the freshness you get with the cilantro and lime juice makes every bite taste like a treat yoself moment. Honestly, if you don’t like this, I don’t like you. 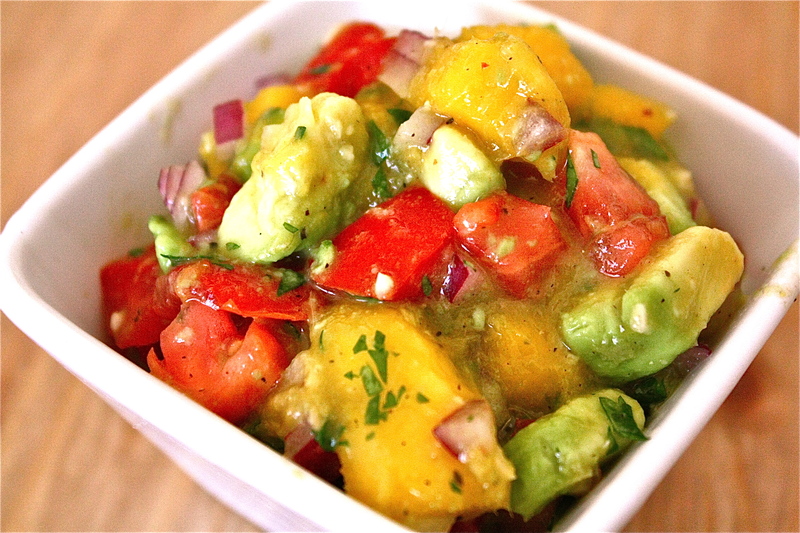 Cut up the avocado, tomato, and mango into fairly small, similar sized chunks and put in a bowl. If you have no idea how to cut a mango, watch my friend, Alton, show you how it’s done, here. Finely dice the red onion and garlic and add to the bowl. Squeeze in some fresh lime juice, using as much or as little as you want. If you’ve tried my guacamole you know how much I love citrus, so I tend to be a little heavy handed with this. Season with salt and pepper and mix well. Taste to make sure all the flavors are balanced–salty, sweet, tangy, etc. Make adjustments if you need to and refrigerate for at least a half an hour before serving to allow the flavors to meld. Use as a dip with chips or a topping on fish, chicken, steak, quesadillas, spoons.. I used it on my homemade BBQ chicken.